Pratchett’s over-the-top satire is not for everybody, but I’d argue that his characters are universal even while being so far off center they’ve slipped over into a different reality (the one where the universe is a turtle with the world on its back). His villains (and they are villains, not just antagonists) are badder than badder, but they never do anything just for the sake of Evil. His protagonists are doing their best, but their best is often hobbled by their vivid personality flaws: Moist is obviously a textbook example of the flawed protagonist, but Adorabelle is not without her problems, nor is anybody in the supporting cast anything but dented and damaged, albeit that most of them are fairly cheerful about it. The closest thing to a flawless character in Discworld is Vetinari, and even there “flawless” is a judgement call. After all, he would have let Moist plummet to his death. Free will and all. So let’s talk about why we really love Moist (if you do) even though he’s a predatory con man who lies and cheat and steals his way through his story. Let’s talk about the Hero’s Love Interest, a heroine who chainsmokes, takes no crap from anybody, and tortures the hero throughout the story, for a very good reason as it turns out. And let’s talk about that antagonist, the wonderfully vile and fabulously named Reacher Gilt. And then there’s Stanley and his pins. So much wonderfulness crammed into one hectic story. 1. Pratchett is writing so far over the top of reality, he’s at space station level. How then does he make characters named Moist Von Lipwig and Adorabelle Dearheart so rounded and real and human? 2. An antagonist should always be stronger, smarter, faster, and better armed than the protagonist. Bring on Reacher Gilt. How is he a great antagonist for Moist Lipwig? Think doppelganger here: In many ways Gilt and Moist are the same person. How does that strengthen the conflict and therefore the story? 3. Pratchett uses supporting characters to build his world: they form guilds, make plans, flirt and betray and divide and connect in chaotic color behind the Big Story played out at the front of the page. One big example in Going Postal is the fallout from Moist deciding to deliver the mail. Let’s talk about character and world building. And anything else you want to say. I know that Moist is a good guy and a colorful personage, but my favorite from this and many other Discworld novels is Lord Vetinari. Now here is a guy who blends good and bad. He acts in a purely secondary role almost everywhere, but I remember him better than many a protagonist. Except Sam Vimes, of course. It would be fascinating if you could comment on Vetinary, Jenny. If you’re inspired, of course. I think he makes a great boundary. That is, the stories are never about him, but in almost every one, he’s the one they bump up against. He’s a tyrant, and he’s implacable, but he’s always right. So even when they maneuver around him, as Vimes and Moist do, he’s like the stout stake at the center of the story, or the guy at the back of the boat keeping everybody rowing in a straight line. I think when you have a character like Vetinari, somebody you know will be always be the smart guy who does the right thing, he’s almost irresistible but also almost too good to be true. That’s why he’s a secondary character. You want somebody with flaws as your protagonist, not an all-seeing mastermind. In a lot of ways, he reminds me of Carrot, who is also always on the side of the right without being pious about it. He simply does what’s right and nobody argues because he’s built like a tank. I think Vetinari and Carrot are two opposite points of the moral compass of Ankh Morport, Vetinari devious as hell (remember his prison cell with the bolts on the inside?) and Carrot completely transparent. One of my favorite scenes in all of Discworld is the scene where Vetinari and Carrot meet in his office, and they both know he’s the hereditary king of Ankh Morpork, and they both know that a king would be a terrible thing for Ankh Morpork and without ever addressing it directly, they tacitly agree that Carrot will stay in the Watch and probably run it when Vimes retires, and Vetinari will remain as tyrant as long as things continue to run smoothly and fairly. But there’s also that tacit understanding that Carrot will be watching. It’s just a lovely understated scene at the end of the book, but it’s huge because it’s between these two giant moral points of the compass. I don’t think either one of them could be a protagonist, although Carrot comes close when he follows Angua home. But in that book, he is vulnerable and flawed, so it works. But yes, I love Vetinari, too. For one thing, he’s so damn funny. Yes, your analysis is spot on. I never thought about it that way. For me, Vetinari is like a movie director. He points the story in the right direction and lets the actors do their jobs, but the vision is his. You know, one of the things that happens every time I’ve read this book, and I’ve read it a lot, is that I’m surprised all over again by how much I HATE Reacher Gilt. I know he’s written to be disliked, but I loathe him. And I wonder how much of that is fed by the 2008 crash, even though this was written before that. It’s a wonderful thing for a reader to despise an antagonist like that. 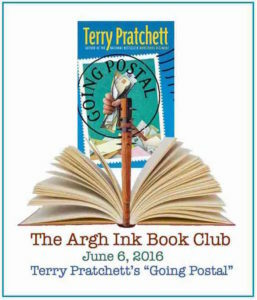 I didn’t like Going Postal. If it hadn’t been for AIBC, I would never have made it past the first chapter. No matter how masterful the writing, I don’t enjoy a book unless I find the characters appealing and, in the beginning, there was nothing appealing about Moist at all. I didn’t begin to care about him until he began to care about others. On top of that, the name Moist makes me think of something slimy, so there was the ick factor every time I read his name. I did learn something from reading this one, though. If nothing else, the importance of characters having enough positive traits that I want to spend time with them. I loved Moist. He was smart and funny and he didn’t whine. But I can completely understand why you didn’t like him: he’s also a liar and a thief. The thing is, if you try to make your characters likable to everybody, they’re so watered down that nobody finds them interesting. So knowing that not everybody will like your character, you roll the dice and go for flawed and interesting anyway. I felt much the same, Carol. If I’d downloaded a sample, I wouldn’t have bought the book. I did enjoy it more after about a third of the way in, but I don’t think satire’s ever going to be my thing. I’m a huge fan of Vetinari. (I mean, of course, in a fantasy sense. I wouldn’t like to live someplace where he’d take notice of me.) Even though his decisions often result in immediate evil, he’s got a moral compass to his actions. He’s not inflexible, though, and he’s very logical and results-oriented. If he’s wrong, he has no problem incorporating the New Right into his fabric of existence. I haven’t re-read the book yet (I hope next week), so my comments are more about the broader Pratchett Universe. Pratchett is very, very good at creating eccentric characters that seem wholly real to me. I think it might be the dialog. They’ll say something completely offhand that totally nails their whole characterization, and reminds me of some British TV show that also has great characterization. I still remember being very angry when he turned Magrat into a helicopter mom. He pegged her so well, but he also had quite a bit of fun at her expense. I wouldn’t be so angry if he didn’t make these characters so real. It’s quite a good trick, and I wish I had the gift of it. I think it’s because he loves all his characters, even Reacher Gilt. Take Stanley. A lesser author would have made him a figure of fun. He’s a mentally disturbed collector of pins. But Pratchett treats him with respect. Stanley isn’t stupid about his pins, he really understands them. He’s mentally disturbed, but he behaves with honor. Moist takes him for granted at first, but learns his worth, just as the reader does, because Pratchett always knows his worth. It’s important to love all your characters, not to do a Frankenstein and abuse the creatures you create. Pratchett loved every character he ever made. I can see that’s his saving grace: it turns a heap of cleverness into a real story. The other thing is that no one is a throw away character; they are all 3-dimensional and fleshed out even when they just have a tiny part. Like the grocer who gets his letter fifty years late, he is vivid and real even though he takes up very little space in the story. Late to the book club, but this was what I wanted to say, and better than I’d have done it. Pratchett so obviously loved ALL of his characters, so they were real to him, and that’s what makes them real to us. He knows their good and their bad and he loves them anyway. Who could resist that? It’s another book, but I was particularly impressed with how Pratchett redeemed one of the two minion/villains in The Truth. Pratchett must have had to look long and hard to find that redemption, but it paid off for me, at least. Oh, the art lover who had his potato stolen? That was lovely. I mean he was criminally insane, but it was still lovely. I have been thinking about the differences between Reacher and Moist and particularly their differing scenes with Vetinari. Reacher plummets to his death while Moist does the bit of dropping the spoon to judge just how far he has to fall. Which says that while Reacher may be a better conman, Moist is a smarter conman. Or at least less arrogant. Because that is probably the biggest difference between them. Moist doesn’t have the arrogance that Reacher does. Moist is squirrelly but he does not seem as arrogant. I think you’re right. It’s arrogance that sends Reacher through that door. I think it’s also what Sara said, that Reacher is used to working on a grand scale and misses the details, especially people details. He swindles on paper and cooks the books. Moist looks people in the eye, and when he looked Vetinari in the eye, he saw the trap. It’s hard to comment about the “inner” Reacher since we don’t have much to go on. He seems to me to be someone who has never really lost. Close calls? Sure, but he ultimately comes out on top. That makes him arrogant enough to advertise (pirate? 12 1/2%? Come on.) Moist has had the gift of a few failures. He’s sure of his abilities and sure that he isn’t really hurting anyone, but also aware that things can go sideways without warning. Moist has a bit in there where he admires him for the pirate outfit; he’s basically saying, “Here’s what I am!” and people smile and nod because who would be that up front about it.